Surface water and groundwater are transboundary resources that often cross political boundaries. Generally, under the United States' federal system of government, no single governmental level has absolute sovereign authority over water. Effective implementation of water policies requires coordination among all levels of government, various administrative commissions, and regional independent agencies. A complex legal and administrative framework controls how federal, tribal, state, and local governments share legal authority over water quality and quantity, as well as over broader water development and management issues. This system is based on common law , constitutional and statutory law, local custom, judicial decisions, and international treaties. Accordingly, different governmental levels have primary authority over certain water issues. The federal government has undisputed sovereignty to develop and manage navigation on interstate or international bodies of water used for commerce. Conversely, primarily state or local governments govern intrastate water quantity and quality issues. Between these extremes, each level of government vigorously guards its authority as the balance of power fluctuates to meet changing water priorities. Across the United States, states have different water issues and concerns. States have considerable authority to establish and implement water laws, policies, and programs suited to their priority water concerns. State authority is especially paramount in allocating water rights. Water-rich eastern states adopted the common-law riparian doctrine. This doctrine allows riparian landowners (landowners adjacent to a river or stream) to use surface water for any locally recognized beneficial purpose. Conversely, arid western states enacted the prior appropriation doctrine to allow nonriparian landowners to establish rights to divert surface water for use outside riparian lands. Faced with growing demands for limited water, other states' legislatures modified the riparian doctrine to allow the state to obtain water rights to protect instream flows and other public purposes. Finally, in certain situations, the U.S. Supreme Court recognizes a federal reserved water right associated with selected types of federal public land regardless of stategranted water rights. State legislatures have considerable authority to develop and manage water. Legislatures realize that local governments and agencies need legal authority to tailor solutions to meet local water development priorities. Hence, over the years, states implemented numerous administrative approaches to water development and management. A historical perspective is helpful to identify general water development and management themes, as well as mechanisms for regional and local governments and agencies to cooperate with federal agencies. During the westward expansion of the United States, Congress adopted laws, policies, and programs for water development and management to encourage settlement and agriculture. State legislatures responded by delegating some of their water authority to regional or local governments and agencies. In many instances, regional county or local city governments would have significant roles in water activities because of their authority over land-use planning and zoning . For unincorporated rural areas, regional or local agencies were necessary to undertake reclamation and development projects. Some common agencies were: drainage districts to drain swamps and wetlands; levee boards or flood-control districts to provide flood protection; and irrigation districts to provide water for crops. The governance of state waters sometimes can be a source of debate. 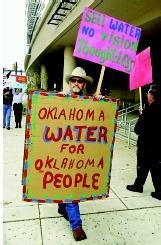 Here a protestor opposes the proposed sale of Oklahoma water to Texas via a possible state-tribal compact. statewide water policy would help guide and coordinate these agencies' activities. Legislatures commonly used two different approaches to create these new agencies. One method was to pass general legislation outlining procedures communities had to follow to create and set the boundaries for a specific type of agency, the agencies' duties and powers, and funding mechanisms. Legislatures could create special-purpose, multi-county or regional water agencies. Regardless of how they were created, many of these agencies have overlapping jurisdictions: some possess broad powers, whereas others are limited to a single purpose. Unlike most statewide agencies, many of these water agencies' boundaries correspond roughly with natural hydrologic boundaries (e.g., drainage basin boundaries). Despite the individual states' water authority, a comprehensive approach to water development, management, and regulation requires interagency, interstate, and federal–state coordination and cooperation. The federal government has numerous programs that offer scientific, technical, and financial incentives for cooperative federal, state, and local water activities. For instance, the National Flood Insurance Program is available to state and local governments that are willing to use their land-use planning and zoning authority to manage floodplain development. Similarly, many federal floodcontrol laws and soil and water conservation laws require regional or local agency partners or project sponsors. The state legislation authorizing regional and local water authority usually expressly lists the federal agencies and programs with whom these agencies can cooperate. The programs described above provide mechanisms for coordinated intrastate watershed management. However, the federal government has a much larger role in coordinated interstate river-basin-scale management. Assorted institutional mechanisms are available to blend national, state, and local authority to address interstate water issues. The Tennessee Valley Authority (TVA) is a unique federal approach to coordinated basin management. Congress created the TVA by statute in 1933 as an independent public management corporation with broad authority to construct and operate dams and reservoirs for electric power generation, flood control, and to improve navigation on the Tennessee River. The use of regional cooperative agreements such as the Environmental Protection Agency's Chesapeake Bay Program is another approach. The region's states voluntarily agreed to formally participate in this cooperative program, which is expressly authorized by the federal Clean Water Act to develop and implement coordinated plans to improve and protect the bay's water quality and living resources. The use of federal–interstate compacts such as the Delaware River Basin Commission is another alternative. Such compacts typically require participating governments to transfer some of their sovereign authority to a commission . Congress and state legislatures must ratify agreements authorizing such a transfer. Compacts often allocate water between states, but can also be formed to meet many water management needs. Many other formal and informal intergovernmental institutional arrangements are in place or are being explored to meet emerging water issues in different regions of the nation. SEE ALSO California, Water Management in ; Chesapeake Bay ; Conflict and Water ; Drought Management ; Floodplain Management ; Florida, Water Management in ; Land-Use Planning ; Law, Water ; Legislation, Federal Water ; Prior Appropriation ; Rights, Public Water ; Rights, Riparian ; River Basin Planning ; Tennessee Valley Authority . Adams, David A. Renewable Resource Policy The Legal-Institutional Foundations. Washington, D.C.: Island Press, 1993. Adler, Robert W. "Addressing Barriers to Watershed Protection." Environmental Law 25 (1995):973–1106. Dworsky, Leonard B. et al. "Water Resources Planning and Management in the United States Federal System: Long Term Assessment and Intergovernmental Issues." Natural Resources Journal 31 (1991):475–547. Houck, Oliver A. The Clean Water Act TMDL Program: Law, Policy and Implementation. Washington, D.C.: Environmental Law Institute, 2000. Reuss, Martin, ed. Water Resources Administration in the United States Policy, Practice and Emerging Issues. East Lansing, MI: American Water Resources Association and Michigan State University Press, 1993. Rosen, Howard and Martin Reuss, eds. The Flood Control Challenge: Past, Present and Future. Chicago, IL: Public Works Historical Society, 1988. Sovereignty is the independence of a national, tribal, state, or local government combined with their right to regulate internal affairs without external approval. Under the United States' federalist system, sovereignty over water is scattered among governmental levels. Theories of federalism explain relationships between different governmental levels as their degree of sovereignty has and continues to shift to address priority water issues. A flexible view of sovereignty is necessary to understand the willingness of federal and state governments to delegate some of their sovereign authority to various regional institutions, such as federal–interstate compacts and interstate compacts formed to allocate or manage water.